Over the years, we’ve noticed that clever crafty people are turning out season-specific toys and decorations for their Easter table, and even for the egg hunt. Here are some ideas that might make you pick up sticks or hooks and make your own this year. For colour-work lovers, we reckon these Nordic Easter Eggs are practically a must-do. For the kids (and the young at heart), Rowan offer a trio of funky chooks, Esther, Ernie & Enid, knit mostly in stocking stitch with little stitched embellishments. Fuzzy Mitten’s chicks are very sweet and need only little bits of yarn and some felt for beaks and feet. If you own one of Lydia Tresselt’s beautiful Lalylala patterns, here’s a free mod that transforms the crocheted doll into a rabbit – there’s a pattern for the Easter eggs too. Amy is crocheting this terribly chic two-legged bunny rattle by Lucia Lanukas for her little girl. 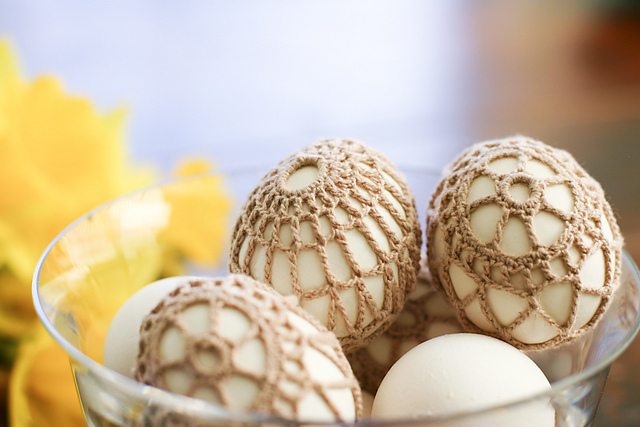 And these lacy egg coverings will make any Easter table just that wee bit more festive. In store news, our Rowan order just arrived, so back in stock are yarns galore and Magazine 57. Also in are two pattern books with designs that are perfect for layering in our autumn. Simple Shapes Purelive Revive and Summerspun features eight designs by Sarah Hatton in Purelive Revive (a mix of recycled cotton, silk and viscose) and Summerspun (cotton and wool) yarns. Patterns span the range from draped cardigans to more fitted tops. Here is Sarah Hatton’s Durum from the book, featuring waterfall-style fronts, basket-stitch borders and set-in sleeves. Simple Shapes Creative Linen has eight designs by Marie Wallin ranging from lace tops to ribbed sweaters, including this pretty Mimosa, with lace bands along the bottom hem and sleeves in a delicate drop stitch. Just in time for holiday knitting, we have kits in store for the Stripe Study Shawl, Simple Sprinkle Shawl and Cliff Hat. These are perfect if you can’t make it instore to pick up the yarn and pattern (we can mail it to you, just phone or email us). They make great gifts, or if you just want to try something different. Our Simple Sprinkle kit features the natural-coloured Tailored Strands alpaca yarns. The Stripe Study kit is in the ethereally light Kidsilk Haze (that halo!). 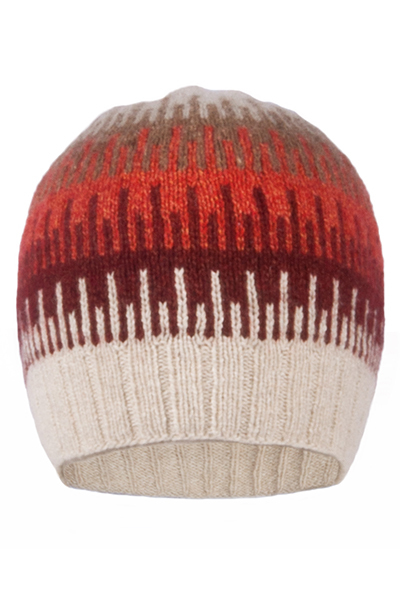 And the Cliff Hat is in five colours of Shibui Pebble. Come in and stock up for some soul-satisfying holiday knitting! Just a reminder, we are closed from Easter Friday until Easter Monday, reopening on Tuesday, 7 April. Categories: Uncategorized | Tags: Easter, Rowan, Sunspun Easter trading | Permalink.